Since 1996, LAI Design Group has been involved in a variety of high density multifamily and attached housing projects ranging from 10 to 200 units per acre. 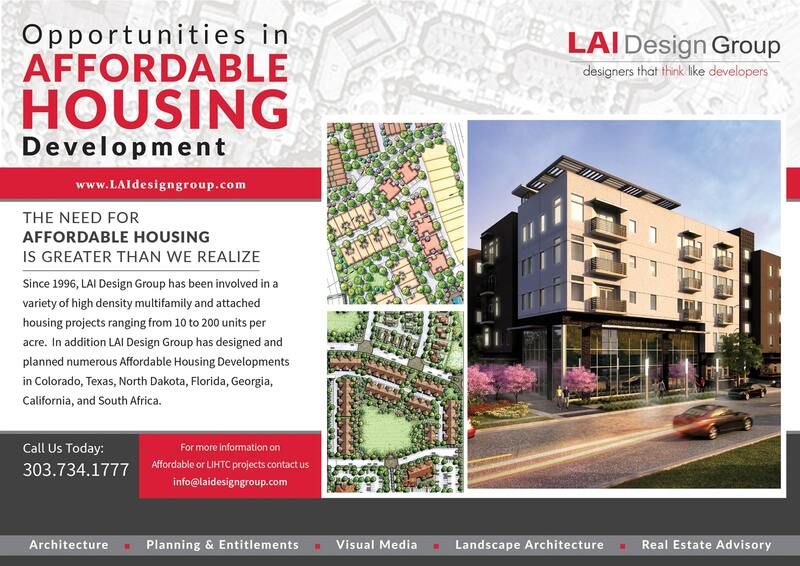 In addition LAI Design Group has designed and planned numerous Affordable Housing Developments in Colorado, Texas, North Dakota, Florida, Georgia, California, and South Africa. As the economy continues to recover nearly 10 years after the mortgage meltdown, the costs of land, building materials and construction continue to rise. As Americans, many of us take for granted having clean running water or a warm dry place to sleep. There are segments of our population that are economically disadvantaged. The double edge sword of a free market society is that some are unable to attain the American dream without assistance. As the greatest country in the world, all Americans deserve opportunities for safe, clean, and affordable housing and this can be accomplished with Economic Development Incentives. Mayor’s in many cities across America including Denver, Houston, San Francisco, Chicago, New Orleans and other major cities have an Affordable Housing Initiative, which is a wakeup call for municipalities, developers and housing authorities to work together to deliver quality housing stock to our fellow Americans in need. Affordable Housing is often financed through Tax Credits (LIHTC - low income housing tax credits) and associated financing sources. These financial mechanisms are a tool that private developers as well as Public Housing Authorities can utilize to create Affordable Housing options. Often times these two groups form joint ventures to execute projects and often times they work independently. Types of tax credits include 9% and 4%. The 9% LIHTC typically provides approximately 70% of a project funds with the remaining 30% made of debt and/or other sources. While a 4% LIHTC provides 30% of project funding, the balance of funds is made up of other sources including debt. The 9% applications are very competitive and only the best projects are awarded funding annually. While the 4% applications are non-competitive, they do require other sources of capital to finance the project. Learn more from the AxioMetrics article "Apartment Supply Needs to Reach 4.6 Million by 2030"
LAI Design Group Architecture firm in Colorado that is vertically integrated firm with a multidisciplinary approach offering services in the disciplines of architecture, land planning & entitlements, landscape architecture, visual media, real estate advisory and development project management services.